What a difference a year makes! Last June saw Britain basking in a heat wave with record temperatures in the late 30s. This year, as if in reflection of the turmoil facing us on the political scene, June has been a largely dull, damp and grey month with only occasional glimpses of the summer sun. It has been distinctly bleak, again an echo of the general mood in the country. The unseasonable weather means that I have had to abandon my principles of never having the heating on in summer! Here is a snapshot of the June skies that were the inspiration behind this month's crochet. June has been an incredibly busy month for me. We had family visiting us for a fortnight over the half term holidays. We travelled to London for a weekend and we spent a few days away in the Lake District. My little boy turned five this month. So as a special treat, we took him on a weekend away to Thomas Land. And I baked cakes. Lots and lots of cakes. 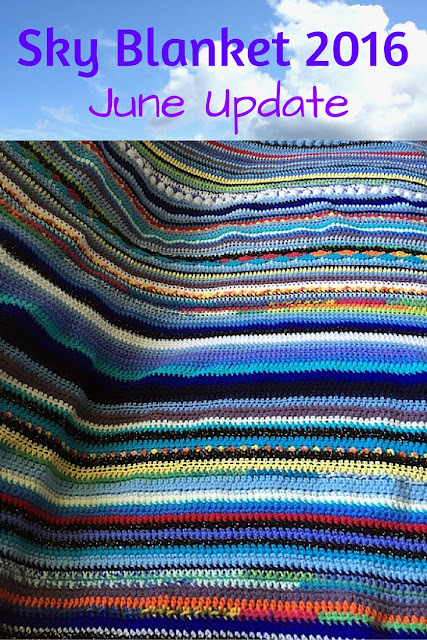 All in all, blogging and crocheting took a back seat as Life in general took over. Due to time constraints, I am crocheting all rows for June in Double Crochet with a hook size 5. No time for experiments this month! Here are the details of this month's pattern, from top to bottom, in case you fancy crocheting along. 24 - half treble in Rainbow Colours (Patons Fab DK) for the gorgeous double rainbow we had today. You're right June has been a bit grey this year in more ways than one, but your blanket is nice and colourful. This is so lovely. You did a great job here!! I am loving the snapshot of June skies. So pretty.